Some like it hot! Sweet and spice makes everything nice, these are the main characters in this delicious tea! This intriguing blend is sure to make your spirits rise as you discover the tantalising tastes and aromas of warming ginger, sweet orange and the exotic floral flavour of vanilla. Find yourself on a path to refreshment, with this delightful cup of tea, as it uplifts your spirits. ginger*, liquorice*, lemon grass*, black pepper*, orange peel*, peppermint*, vanilla extract*, orange extract (natural flavour), *= Ingredients marked with * are certified organically grown. 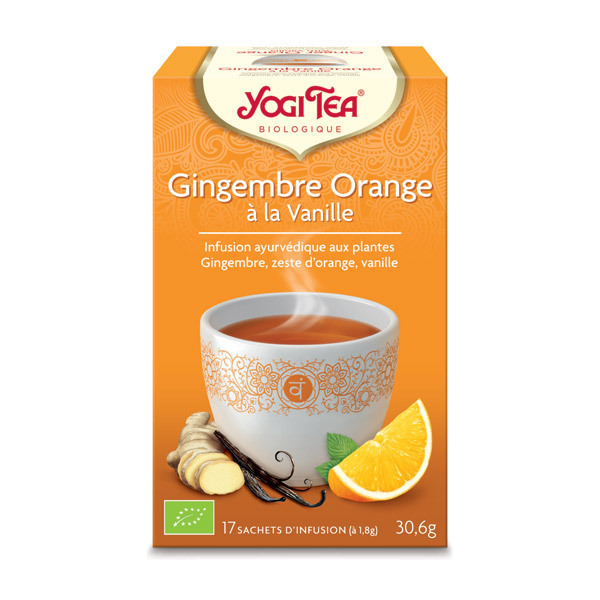 Yogi Tea creates and manufactures a wide variety of teas, including green, herbal, black and red tea. Yogi Tea‘s philosophy is rooted in Indian Ayurveda, which combines sensual pleasure with a balanced approach to overall well-being. The company is committed to providing the highest quality ingredients while protecting the planet’s natural resources. All herbs and spices use by Yogi Tea are grown in organic-certified landfills.